What is a flat wart? Flat warts are benign growths of the skin and are caused by certain strains of the human papillomavirus (HPV). They can affect people of any age but they are particularly common in puberty (12-18 years old) and in people with a defective immunesystem. 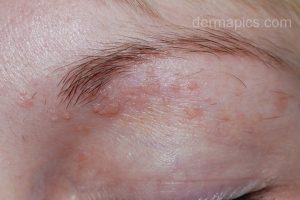 flat warts in the face can appear as slightly raised brown lesions. 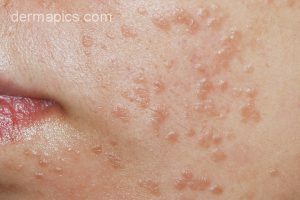 Flat warts are slightly raised, flat-topped, skin-colored papules. Sometimes they are somewhat lighter or darker than the surrounding skin. They range in size from 1 to 4 mm and can appear in large numbers. The most common locations for flat warts include the face and the back of the hands. In men the beard area is a common location. the face and the back of the hands are the most common sites for flat warts to appear, however, they may occur elsewhere on the skin. What is the cause of flat warts? Warts, including flat warts, are caused by members of the extensive human papillomavirus (HPV) family. For the most part, flat warts are caused by HPV types 3, 10, 28 and 49. The most common way to become infected is by direct skin contact from one person to another. Transmission of the virus is facilitated by small defects in the skin barrier such as scratches or cuts. When one has contracted the virus in one place of the skin it is quite easy to spread it to other locations. A well known way is through shaving.